Bath lifts have long served the purpose of helping individuals regain their independence and offering convenience when bathing. When it comes to aiding those with special bathing needs, look no further than the Aquatec RSB Wide Bath Lift to alleviate all of your problems. This battery-powered bath seat allows you to enjoy a long soak and the therapeutic effects of a warm bath by helping you lower and raise yourself in the tub without straining knees, hips or shoulders. This RSB wide lift fits all standard home tubs as well as wider-style whirlpool tubs in order to accommodate you in any situation. The lift includes a seat with reclining back support and removable covers as well as a rechargeable battery and charging unit. It also features adjustable side flaps that provide stability and support for the upper body, and the flaps lift at the hinges to pivot forward for back support or back for clearance while transferring. The Aquatec RSB lowers to 2.5” from the bottom of the tub, then the back support reclines 35 degrees for maximum comfort. The reclining effect allows you to shampoo your hair without getting any soap in your eyes or to simply lie back, relax and enjoy the effects of the warm water. 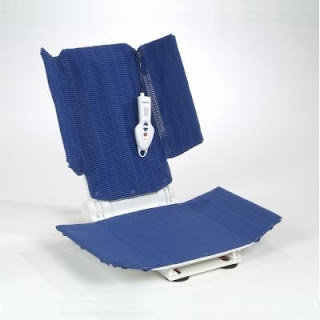 All Aquatec bath lifts are constructed from reinforced plastic and stainless steel components, and this particular unit comes with covers that are removable and machine washable for your convenience. It sports a hand remote that has easily-identified up and down buttons and low power indicator, a lithium-ion battery in the hand control for easy recharging and self-release suction cups that adhere smoothly to tub floors to aid in a stable transfer. Now is the perfect time to purchase this lift as it is now 20% off and qualifies for free shipping! Be sure and browse PHC Online for all of your medical needs!